Algreen's solar food-waste digester accepts household kitchen waste and leftovers, including raw and cooked meat, bone, and pet waste! The solar food waste digester's solar decomposition process expedites the breakdown of organic waste and allows for the matter to disappear into the soil while fertilizing the surrounding soil. Compost Happens "The Free Garden EARTH compost bin is an efficient, durable, and economical tool that saves money and provides many benefits for homeowners and gardeners. Manufactured of 100% recycled content, its single-unit main body construction means no difficult assembly, and no structural integrity issues over time or in extreme weather conditions. The animal and pest resistant lid twists for variable ventilation control, and covers a large 19.5 (49.5 cm)opening that offers easy, generous access to add material and maintain the pile. Dual 6.7 cu. ft. Compost Tumblers is rated 4.2 out of 5 by 217. Rated 3 out of 5 by Nupur from Great concept but -It becomes completely disfunctional pretty quickly Cons: We bought this composter from Costco a few years ago. It was hard to assemble and we realized that it was hard to rotate. Its locking mechanism was kind of finicky from day 1. And the drums leaked constantly due to water logging in our PNW weather. The Aereator bar inside got clogged pretty quickly. And the locking mechanism stopped working due to immense rusting. The lids do not want to close completely. Two years ago, I cleaned the parts by pressure washing and neemoiled DW40ed the latch etc. I was able to get one side to work somewhat. The other side is permanently stuck. This year, the latches do not work, so the drums can not be spin. However I am still dumping stuff in there out of habit and trying to hand turn it! It is a pain in the neck. I have not gotten another product because of the fact I have yet to find something which may be a better design The good part is: It has a stand, so your compost is not sitting on the ground and rodents infestation associated with composting is non-existent. The idea is really good that you can rotate the drums and compost one side while the other side is an active collection side. I wish it had not rusted so quickly and become inoperable. I wish there was a technician out there who could come out and fix the problems with this composter. Rated 5 out of 5 by James from Awesome customer service Our composer is about 5 or more years old, I contacted customer service hoping to purchase replacement parts, the person that responded said that they would provide all parts needed. They sent us the replacement parts and we are in business. Would highly recommend lifetime products, they definitely stand behind their products. Rated 5 out of 5 by Rinda from Parts I was having trouble with some parts and Shawn was Kind enough to help with a solution . I appreciate prompt service. Rated 5 out of 5 by Jim100 from Great long term service Brought my bin composter many years ago and needed a new turn handle. They responded quickly to my request and I had my spare part with in a matter days. It is a pleasure dealing with a company who really cares about their product, customers for the long term. Excellent service support. 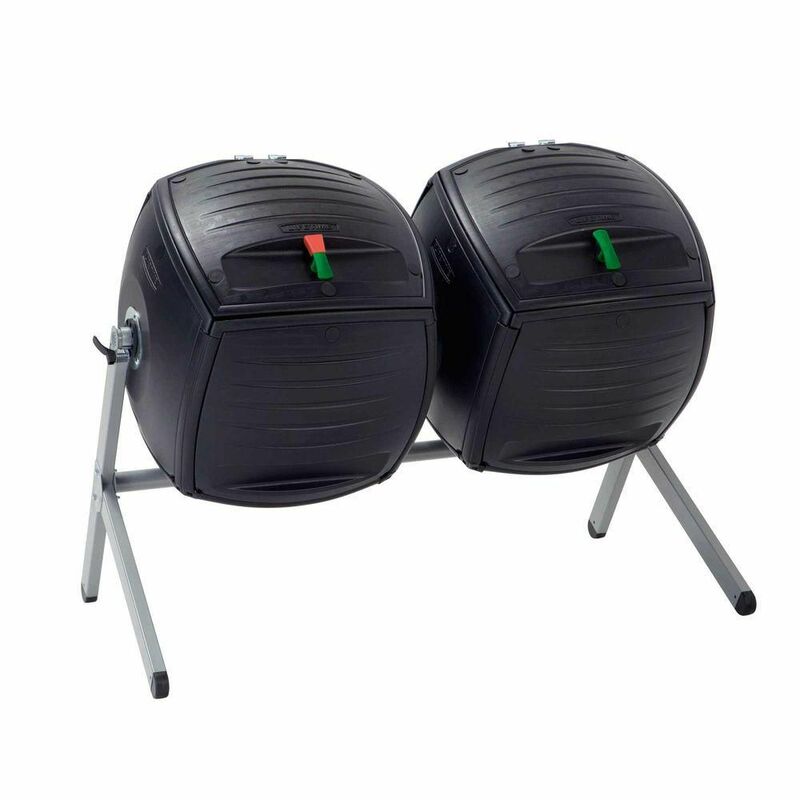 Rated 5 out of 5 by Canadian Gardener from My favourite composter We bought one composter and liked it so much we purchased another one the following year. It has a large opening that ensures it is easy to get the compost materials in and out of the container. It is large enough for the contents to heat up but still small enough to turn easily. Living in a high-altitude, zone 3 area (aka. cold), we are usually able to empty 3 of our compost barrels in the fall and the fourth in the spring. An added bonus is that this composter doesn't attract rodents. Rated 5 out of 5 by Connie1 from Easy to use, love it I bought this over 4 years ago and I love it. Its easy to use and it looks great. It keeps all the compost inside the tumblers and this elimintaes many of the odors and mess associated with composting. Animals cannot get into the tumblers and that gives me piece of mind. The only draw back I experienced was that the metal hinges after years of use did give out and actually broke away from each other. I called Lifetime and they sent me replacement hinges for both without hesitation. They were easy to replace and now its like I have a brand new composter. I truly appreciate a company that stands by their products. I definitely recommend this composter for anyone that wants to have success composting, does not have a very large space and composts small quantities at a time. Rated 4 out of 5 by Rocko from Great composting bin Great product, even though the hinges and latch failed after 4-5 years. The company made good on free replacements of the failed parts. I'm a happy camper! Are the holes in the bins large enough to let in bees and wasps? The holes are small and we have not had any customer complaints about bees. That being said, Bees can fit in spaces as small as 3/16-inch and can be pretty tricky so we cannot guarantee that they won't get in. But if bees move in to your compost bin you may not want to hastily dispatch them. If you're growing flowers, vegetables or other plant life, or you have a tiny insect problem, then bees may be just what you need. Many bees are good pollinators, can aid your garden's growth and eat smaller insects that may otherwise harm your plants. You can find tips online for avoiding them if you'd like to learn more.